Panathletes Billie Lambert, Finn Knaggs and Shahayna Begum were among the award winners at the glittering Yorkshire Children of Courage awards in Leeds last Friday night. The event sponsored by St. James’s Place Foundation, celebrated the achievements of some of the county’s most inspirational young people and was attended by the likes of Paralympic wheelchair athlete Hannah Cockroft, Olympic gymnast Nile Wilson, Leeds United legend Eddie Gray and former Huddersfield Giants rugby league player Erol Crabtree. Regular Panathlon competitor Finn Knaggs, 15, from Guiseley near Leeds, received a special recognition prize in the event’s 13-to-18 age category. Finn (pictured above with performer Ray Quinn) was left with profound sensory neural hearing loss and complex epilepsy after contracting pneumococcal meningitis at seven months old. But he refuses to let his disabilities hold him back and has flourished through his love of Panathlon competitions, as well as football and table tennis. He received Panathlon’s North Yorkshire ‘Outstanding Achievement’ award in July. Another success for a Panathlon competitor on the night was Billie Lambert, who is a pupil at Brighouse High School and is visually impaired. 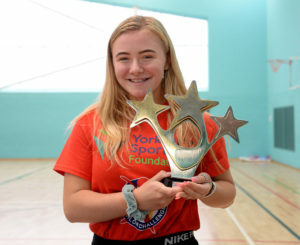 She was awarded the Yorkshire Child of Courage Sporting Achievement prize for the secondary-school age group. She is pictured above (in red) showing the trophy at Thursday’s Northern Multisport Final in York. “I had no idea that I was even going to win the award. When my name was announced I just felt completely shocked and blown away! I just couldn’t believe it!” she commented. Billie’s mum Claire Lambert said: “With everything that Billie has gone through it’s wonderful to achieve this award in recognition of her never giving up and pushing herself to her limits. Billie was presented with her prize by five-time Paralympic gold medallist Hannah Cockroft, who used to be coached at Halifax Harriers by Birgin. Earlier this year, Billie was awarded Panathlon’s West Yorkshire ‘Highly Commended’ trophy for her achievements. Winner of the Yorkshire Child of Courage Sporting Achievement prize for the primary-school age group was Shahayna Begum (pictured right), a pupil at Girlington Primary School in Bradford. Shahayna is profoundly deaf, can’t access speech and can only hear very loud environmental sounds. She uses sign language and lip patterns to communicate. Shahayna, who also received one of our West Yorkshire ‘Highly Commended’ awards in July, captained her school boccia team to a second-placed finish in the Bradford Panathlon last year and they also finished runners-up in Panathlon’s West Yorkshire competition. The Yorkshire Children of Courage awards were featured on the Made In Leeds TV channel. You can watch the video here. Select the October 16 bulletin and forward to 6 mins.